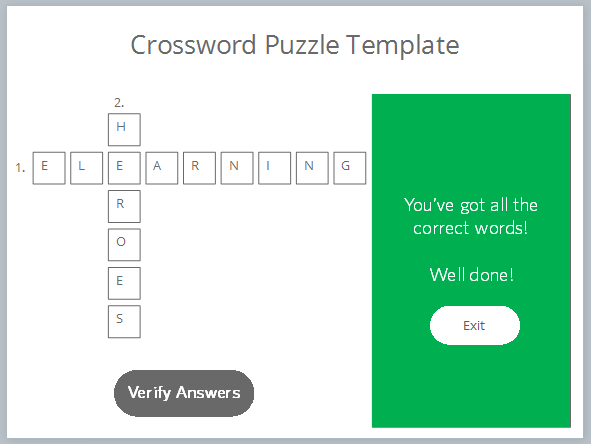 As e-learning designers, we’re always looking for ways to jazz up our courses—and a fun way to do this is to incorporate simple games into your e-learning. 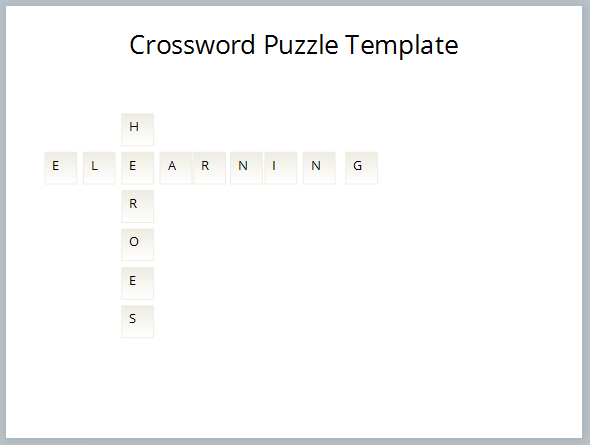 I recently created this crossword puzzle template in Articulate Storyline 2. I think it would be a great interaction to adapt into an informal knowledge check or quiz about your courses’ subject matter. Let me break down the process for you of how easy it is to create this interaction. 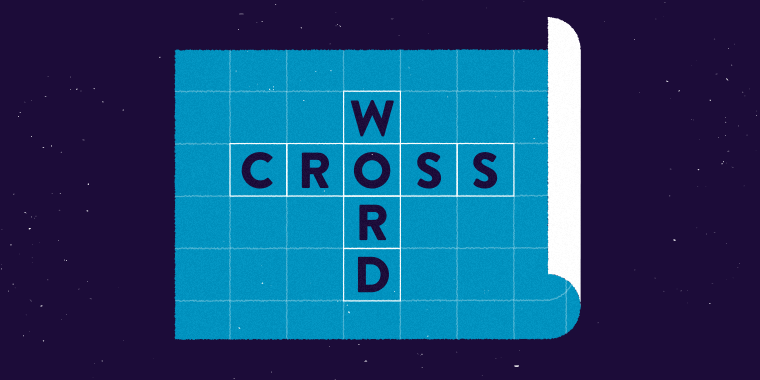 The key to this crossword puzzle is the use of data entry fields, which is the first step. 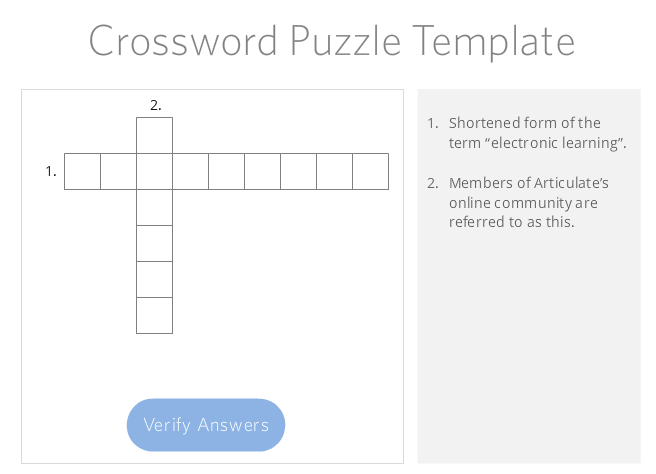 Insert a small, square-shaped text entry field, then duplicate it until you have one text entry field for every letter in the crossword puzzle. At this point, it helps to actually type the letter into the text entry fields to spell out the words and make sure you have the right amount of boxes. We’ll remove those letters later. With these text entry fields in place, I quickly styled them by selecting them all and editing the fill and outline color. A great way to line up the text entry fields perfectly is to use the align feature under the format tab on the Storyline ribbon. I needed to add a few more important elements to my slide to get this interaction working. 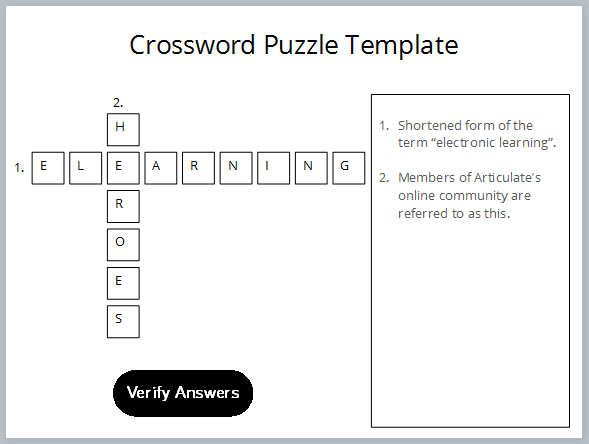 First, I added an area on the template to put the hints for each word. Then I inserted the corresponding number next to the word in the crossword puzzle. Finally, I inserted the button that users click to check whether their answers are correct. See how it’s starting to come together? Now that I have the basics in place, it’s time to create a couple of feedback layers that will tell users whether their answers are correct. It’s often a challenge for instructional designers to decide how and when to provide feedback. In this case, I decided that the best approach was to give learners the standard two feedback types: correct and incorrect. One says all the words in the puzzle are correct, and the other indicates there’s at least one incorrect word in the grid. However, the feedback doesn’t elaborate as to which word is incorrect—it’s up to the learners to figure out where they went wrong. 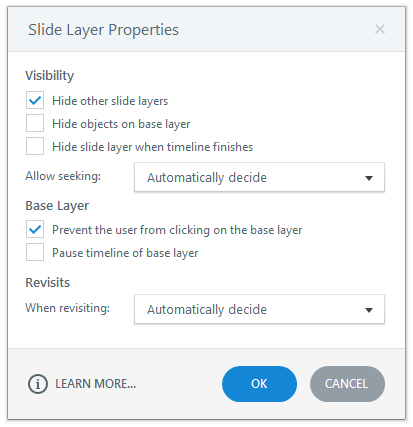 I first created the “correct” layer by inserting a new layer on my slide. To create my feedback area, I inserted a rectangle shape over the top of the hint area with the correct feedback text and made the rectangle green to indicate a visual sign that it’s correct. I also added a button to exit the game, since once all the answers are filled in correctly the game is done. With everything right on my first layer, I duplicated it and edited the text and shape color for incorrect feedback. On this layer, the slide lets the learner return to the game to keep trying instead of exiting. 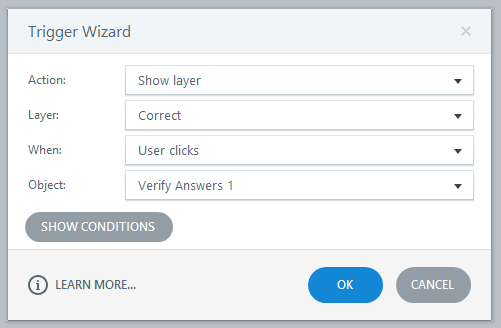 Don’t forget to pop into your Layer Properties for both feedback layers and to check off the option to “prevent the user from clicking on the base layer,” which keeps learners from working on the crossword puzzle until they’ve closed the feedback layer. We’re almost done! The slide elements are in place and the feedback layers are all set. The last step to get this interaction working is to add the triggers. 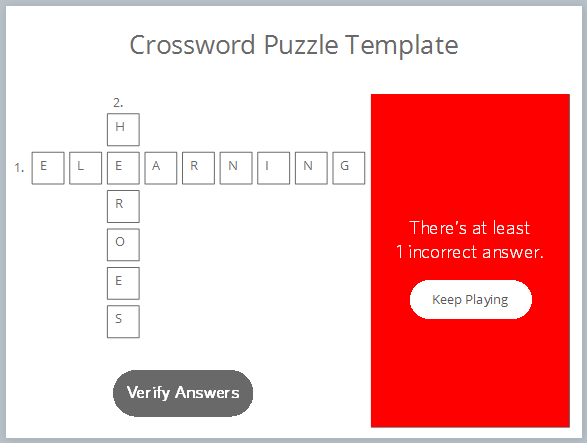 I only need two triggers for this crossword puzzle, which I’ll add to the “Verify Answers” button. 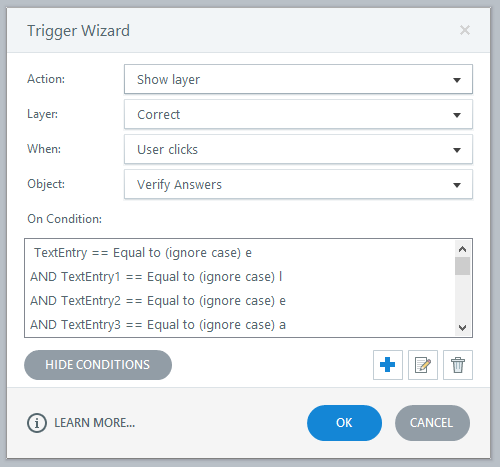 The logic behind the first trigger is: check that every text entry field has the correct value (letter) typed in it, and if they are ALL correct, show the “correct” feedback layer. The logic behind the second trigger is: if even one text entry field has the incorrect value in it, show the “incorrect” feedback layer. It says: it will only show the correct feedback layer if the “TextEntry28” value is equal to the letter e (and it doesn’t matter if it’s a capital or small e). Remember to ensure that each text entry variable corresponds to the correct value. Take a look at the image below. 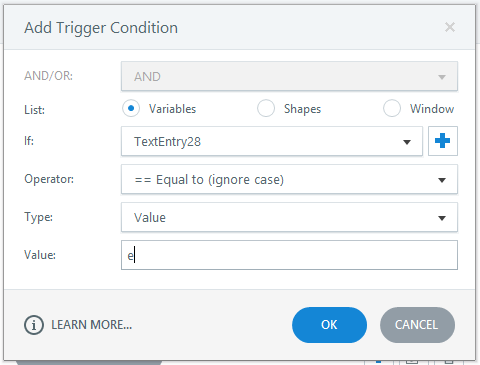 The first “e” in the word “elearning” is selected, and you can see that it’s corresponding text entry variable is identified in the triggers panel, “TextEntry28,” where it is highlighted in blue. These two triggers are all you need to get this interaction working. Remember: it's all about getting the conditions just right. There you have it: those are the simple steps I followed to create a game interaction in Storyline in just a few minutes. When it comes to adding aspects of gamification to your course, features such as the variables and data entry fields will be some of your go-to tools for creating fun and engaging content. Head on over to the Downloads section to grab this template, and leave me a comment to let me know if you have any questions. I love crossword puzzles, so this is one of my favorite interactions! Something I don't understand: how do you change each “AND” to “OR” under the trigger conditions? Hi there... this is great but I'm having a problem... when I use "AND" it doesn' work but when I use "OR" it works... Does any one have any idea why? AND is inclusive. If we look at your problem, where using 'AND' doesn't bring up the incorrect layer....because using AND is telling articulate that all your listed conditions must be incorrect for the 'Incorrect Words' layer to show. OR means that only one of the letters need to be incorrect for the 'Incorrect Words' layer to show. In other words, where AND is used every condition has to be met to launch the 'Correct' layer as set in the Trigger. Where OR is used any of the conditions, even just one incorrect letter will launch the 'incorrect' layer. Hope I've explained this properly.